With all the essential moving services, Meathead Movers is fully prepared to get you safely into your new home. Our clean-cut student-athlete North Hills movers are dedicated to fulfilling all your moving needs to your satisfaction. Our North Hills movers Welcome you to the Meathead Movers family! Whether you’re moving to North Hills or leaving the area, North Hills is a beautiful place to call home. If you’re ready for change, our North Hills movers can help you and your family move to or from this beautiful community. Located in the beautiful San Fernando Valley, North Hills is a welcoming neighborhood within the city of Los Angeles. With its prime location, residents of the city can easily travel into downtown Los Angeles for sporting events, concerts, excellent night life, fine dining, art, shopping, and much more! The town was primarily an agriculture community but has developed into a thriving community since then. Modern North Hills is home to great public and private schools, one of the area’s largest libraries, and excellent dining choices. 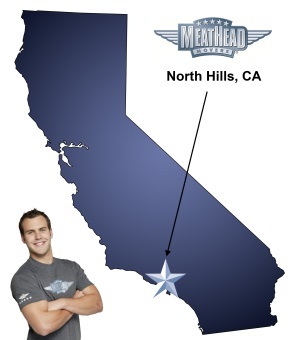 If you are considering a move to or from North Hills, Meathead Movers is here to help! Our North Hills movers are well-equipped to handle any moving job, including packing, storage, local moves and long distance moves. Our staff can organize on-site relocations and commercial moving projects. We also carry a full range of moving supplies to ensure any job can get done right. All our student-athlete movers are thoroughly screened and trained before their very first move. With branches throughout California, we are your one-stop resource for all your moving needs. We have been revolutionizing the moving industry since 1997. When you entrust your move to our North Hills movers, you can rest assured knowing that your move will be a success because our professionally trained student-athlete movers are the best movers the industry has to offer. In fact, you can see what your neighbors have to say about us! We are so confident in our services, that we even offer a 100% satisfaction guarantee! So, what do you have to lose? Contact the North Hills movers at Meathead Movers today for a free moving quote, and learn how we can help you on your next move! View more North Hills resources. I love the company's mission statement. The move was quick and professional. The only reason I didn't give a 10 is because they gouged a hole in my freshly painted wall, but I didn't notice until after they left because it is fairly small and close to the floor. The guys are professionals and they work to keep to the schedule and safeguard the household items. First time I have used movers who never complained about anything. They were nice guys, efficient, careful with everything. They listened and did the move exactly like we asked with a great attitude. Easiest move ever!! THANK YOU! These guys were quick and professional!! Exactly what I wanted! !